Top Sugar Stocks gives 1000% return in past one year – Should you invest? Home » Stock Market » Top Sugar Stocks gives 1000% return in past one year – Should you invest? A Sensex has given a negative return in past one year. 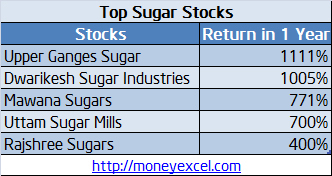 However, top sugar stocks have given returns in the range of 200% to 1000%. This means sugar stocks have multiplied wealth of investor from 2 times to 10 times. The price rise in sugar stocks is mainly due to fall in production of sugar both in domestic and other major producing countries. Due to fall in production, the price of sugar has increased and profit margin of sugar stocks have increased. The sugar price in domestic has increased by 25% in past one year. Sugar is being sold at Rs 40 a kg today. In order to control sugar price, the government took the decision to impose 20% export duty on raw and refined sugar. This news had made an adverse impact on sugar stocks and these stocks have stumbled from 8-20% recently. So, is it a good time to invest in sugar stocks? Let’s try to analyze the Top sugar stocks. Upper Ganges Sugar is one of the oldest sugar companies of the K.K.Birla Group. UGSIL owns three sugar manufacturing units in UP and Bihar. In last one year, this stock has touch 52-week high-level Rs.438 and given a return on 1111% to the investor. Upper Ganges Sugar has posted a very good profit in past one year. Dwarikesh Sugar Industries is one of the fastest growing sugar companies. In addition to that company has a strong presence in other fields. Dwarikesh Sugar Industries stock has grown by 1005% in past one year. The revenue of company has increased in past one year. The company posted 52.82 Cr profit in past one year. Mawana Sugar is next in the list of top sugar stocks. Mawana Sugar is in the business of manufacturing and selling of chemical, sugar, ethanol and edible oils. Mawana Sugar was penny stock before 1 year and today it has grown by 770%. Mawana sugar has posted a very good profit and revenue growth and it is good to invest in this stock. Uttam Sugar Mills is next sugar stocks in the line. Uttam sugar stock has posted magnificent growth of 700% in past one year. Uttam sugar mills have posted very good sales and profit growth in past one year. Rajshree Sugar is last in the list of top sugar stocks. Rajshree sugar is in the business of sugar and chemicals. In past one year, this stock has given a return of 400%. The rise in sugar price and growing demand were the prime reason why this company was able to post a profit. 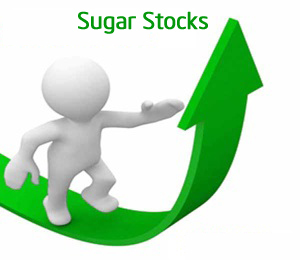 Way Ahead – Should you invest in sugar stocks? It seems bad phase of sugar stock is over now. Many sugar stocks company has done turn around in the March quarter. It is expected that financial health of these sugar companies will strengthen further in the upcoming year. It is expected that good monsoon will increase production of sugar cane and sugar. The price range of sugar will marginally improve. However, the global deficit in current and next season will surely help these sugar stocks. These sugar stocks are good for investment for next three years perspective. Do you think sugar stocks will give good returns in future? « How to update KYC EPF UAN Online?